ON-SITE TECHNICAL SERVICES, INC. is currently providing inspection related services on Capitol Improvement Projects for the following agencies. The Carlsbad Desalination project is the largest desalination plant in the western hemisphere. The $922M project is the first large-scale desalination plant on the West Coast. The project includes a desalination plant, a pumping station, product water storage and a ten-mile product water conveyance pipeline. The plant will produce 50 million gallons of desalinated seawater (MGD) a day and provide ten percent of the total drinking water needed by San Diego. ON-SITE provided factory inspection of the 50,000 lineal feet of 54” diameter heavy wall high pressure welded steel pipe and fittings at several fabrication locations in both Southern and Northern California. 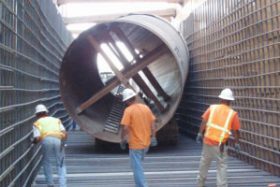 Additionally 28,000 lineal feet of 67”-69” diameter of RCCP required steel relining at fabrication locations in Phoenix AZ. The San Diego County Water Authority’s Pipeline Relining program, takes a proactive approach to pipeline maintenance. This 30-year program focuses on pipelines showing signs of deterioration and joint damage during internal pipeline inspections. ON-SITE provided fabrication inspection and Welding Engineering support during the installation of the steel liners. ON-SITE also assisted in the development of Phased Array Advanced Ultrasonic testing program, forensic analysis and root cause determination of material failure of steel during manufacturing processes. The San Vicente Pump Station Projects are a part of San Diego County Water Authorities Emergency Storage project. The Pump Station was built to provide facilities for 3 horizontal centrifugal pumps, including 7000 HP motors, 2 variable frequency drives and transformers. 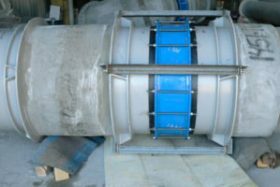 The work being performed consists of the construction of a new pump station, surge control facility and inlet-outlet structures, installation of fabricated steel pipe and fittings, and related systems, gates and valves, and other appurtenances. ON-SITE provided shop fabrication inspection services of the mechanical equipment and 5,000 ft of large diameter steel pipe and specialty fittings associated with this project at various locations both domestic and overseas in Japan, Germany, Brazil, China and Canada. The Lake Hodges Pipeline and Hydro Electric Pump Station is a part of San Diego County Water Authorities Emergency Storage project. Hydraulic turbines will provide the additional benefit of capturing energy created when water flows from the Olivenhain Reservoir into Lake Hodges. The pump station will generate 40 Megawatt capacity by utilizing 2 each 20 MW (15300 HP) vertical generators. This project will increase the amount of water available within the county for use during emergencies. 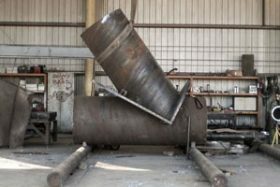 The work being performed consists of the construction of a new pump station and inlet-outlet structures, installation of 5,800 ft of 121-inch diameter fabricated steel pipe and fittings, and related systems, gates, valves, and other appurtenances. 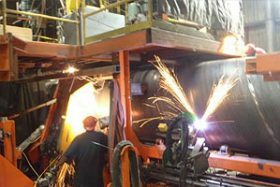 ON-SITE provided shop fabrication, welding engineering support during installation, inspection services of the mechanical equipment and large diameter steel pipe and fittings associated with this project at various locations both domestic and overseas in China, Brazil, and Canada. 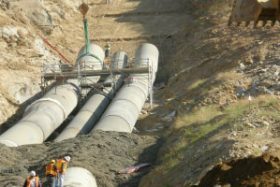 San Diego County Water Authority’s Mission Trails Pipeline Tunnel Project maintains critical water pipelines beneath portions of Mission Trails Regional Park in the city of San Diego. The Water Authority is upgrading its untreated water system in the northwest area of Mission Trails to deliver more water to treatment plants that serve the central and south sections of San Diego County. The project will help ensure water reliability in the region through the year 2030. 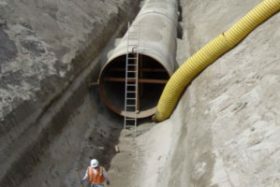 The major elements of the Mission Trails Project consist of Construction of a 25,000 ft 94 inch diameter pipeline tunnel and associated pipeline interconnections, and Construction of an underground flow regulatory structure. ON-SITE provided shop fabrication inspection services of the mechanical equipment and 25,000 ft of large diameter steel pipe and specialty fittings associated with this project at various locations both domestic and International. The San Vicente Pipeline Projects are a part of San Diego County Water Authorities Emergency Storage project. The Emergency Storage Project will protect the San Diego region from potential disruptions to the water delivery system by increasing the amount of water stored locally. The project is creating new emergency water storage and pipeline connections, enabling water to continue to flow throughout the region even if the imported water supply is disrupted. The Emergency Storage Project is expected to meet the county’s emergency water needs through 2030. 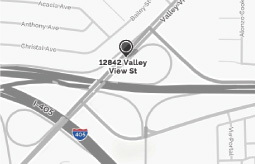 The 11-mile San Vicente Pipeline is a 102 inch-diameter pipeline connecting San Vicente Reservoir in Lakeside, to the Water Authority’s Second Aqueduct west of Interstate 15. The pipeline will be built in a tunnel at a depth ranging from 50 to 550 feet underground and will not pass directly under any homes. To provide water during emergencies, the San Vicente Pipeline will function together with other Water Authority facilities and connecting pipelines near the reservoir to allow water to be distributed to agencies in the southern half of the county. ON-SITE provided shop fabrication inspection services of the mechanical equipment and 57,000 ft of large diameter steel pipe and specialty fittings associated with this project. The Robert B. Diemer Water Treatment Plant is one of Metropolitan Water District of Southern California major construction projects located in Yorba Linda California. This $153 M project includes site work in preparation for the ozone treatment facilities; large diameter pipe and specialty fittings, Equipment for Ozone related chemical storage and feed facilities and an ozone generation building, which will help ensure compliance with stringent drinking water standards. The plant is capable of treating up to 520 million gallons of drinking water a day, enough to meet the needs of 3 million people. The plant features a hydroelectric generator capable of generating up to 5.1 megawatts of power, which is sufficient to light 4,600 homes. 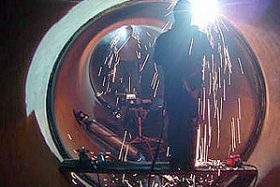 As an owner representative ON-SITE provided shop fabrication inspection services of the mechanical and electrical equipment and large diameter steel pipe and fittings associated with this project. San Diego Pipeline 6 Northern Reach Project, which involves the construction of over 7 miles of 120″ Diameter pipe that will deliver water from the Colorado River to Riverside and San Diego counties. This $100 million project is a critical link in the regional water supply for this region. 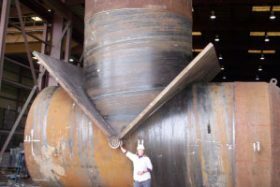 ON-SITE provided site inspection and shop fabrication inspection services of over 7 miles of 120″ diameter steel pipe and fittings manufactured at several locations simultaneously throughout the United States. Our inspectors also performed inspection of the engineered equipment associated with this project, which includes the inspection of 42″ Check valves, 144″ Butterfly valve, various diameter high performance butterfly valves, flow meters and electrical instrumentation, at locations throughout Japan and the United States. The San Jacinto RWRF Conversion to Tertiary Project will bring the San Jacinto RWRF up to tertiary level for the installation of tertiary filters. This $9.5 million project consists of 62-inch diameter specialty pipe and fittings. The Perris Valley RWRF Expansion Project is part of construction to increase the treatment capacity from 11 MGD to 22 MGD. This $101 million project consists of manufacture of 50-inch diameter specialty pipe and fittings. These projects are part of the districts Water and Wastewater Facility Master Plan to reflect the anticipated growth projections up to the year 2025 and define the facilities that will be required to meet the needs of this growth. Calleguas Municipal Water District has embarked on an ambitious capital improvement program to “drought-proof” its service area to minimize potentially debilitating effects associated with seismic activity. Numerous projects are currently under development to reduce the region’s demand for imported water. ON-SITE TECHNICAL SERVICES INC has a direct contract to provide professional services performing fabrication inspection and project site inspection support for this program. In addition ON-SITE is often called upon to offer technical assistance and aid in the development of inspection procedures. One such project required our assistance in the development of repair procedures and offer project site support during a catastrophic failure of a steel tunnel liner, which ruptured prematurely. 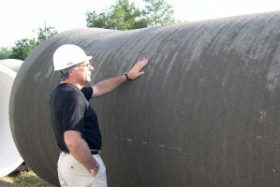 ON-SITE TECHNICAL SERVICES INC provides inspection of the large diameter steel pipe (PVC/HDPE), fittings, valves, steel reservoirs and coating inspection at locations throughout the United States. 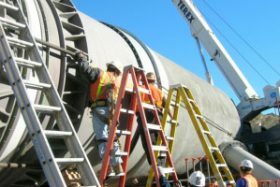 City of Albuquerque Water Treatment Plant Project consists of 15,000 feet of 72 inch to 120″ inch diameter steel pipe and fabricated fittings being manufactured at 3 separate manufacturing facilities throughout the United States. 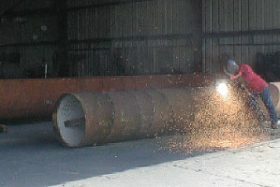 ON-SITE provided the Quality Assurance inspection of the large diameter pipe, fittings and coating applications at locations throughout the United States. 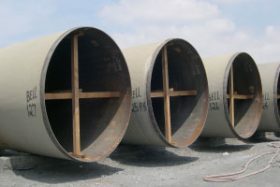 Lancaster Water Reclamation Plant Stage 5 Recycled Water Transmission Pipeline consists of the manufacture of over 45,000 ft of 36″ diameter steel pipe and fabricated fittings. The Lancaster WRP provides primary and secondary treatment (aerated oxidation ponds) for 16 million gallons of wastewater per day and serves a population of approximately 160,000 people. ON-SITE provided inspection of the large diameter pipe, fittings and coating inspection at locations throughout the United States.